Use the Ad Builder to create interesting image ads based on templates. You can design an unlimited number of creatives for free. You don't need any special skills or experience to create them. In the space of a few minutes you can create ads without the help of a professional designer. To create or edit an image ad, go to the Creative section and click Add → Create new from template. Using a template. With templates, you can choose all the settings for the design. Just select a template from the Standard templates tab. Based on a site. If you don't know where to start, the Ad Builder will generate ideas for your creatives based on the texts, images, and color of a website. Then you just need to edit the idea to get your resulting creatives. Go to the Creative ideas tab in the Ad Builder and enter the URL for your webpage. Select one of the template or idea options. This opens a window where you can create a group of creatives. On the left side of the window, select the sizes you need. They are all selected by default, so that ads can be shown in as many places as possible. On the right side of the window, select an image, fill color, and border, and add your main text. You can add your own image, select one from the library or use images previously uploaded by you. The border color must not match the background (the selected background color or the colors in the uploaded file). Enter the appropriate information in Age rating, Warning, and Legal information. Please note that all information required by law and the Yandex Ad Serving Rules must be present on the creative, including age restrictions and warnings. You can view all changes you make instantly in the preview area. To check the legal information, hover your cursor over the icon in the lower-left corner of the creative. When you have finished working on creatives, click Create. The creatives will be added to the library. 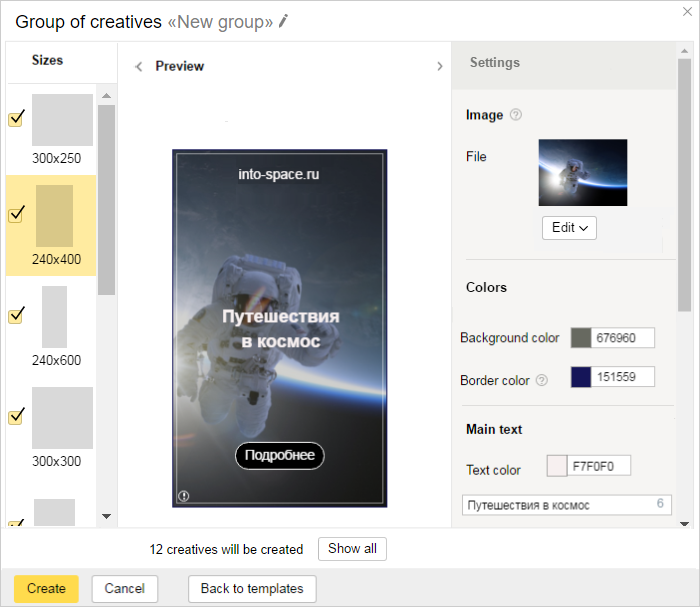 A separate image ad will be created for each creative in the set. You can add up to 50 ads to a group. You can use your ad creatives in other groups. An image ad creative from Ad builder can only be replaced with an Ad Builder creative of the same size. It can't be replaced with a creative uploaded from your computer or the internet. You can export an XLS file with links to all the creatives that were made in the Ad Builder. To do this, click Export list to XLS. You can use these links to add the creatives to multiple ads at once via XLS/XLSX files. You cannot transfer creatives between accounts.